Tony ‘Rocket’ Laver is a forty-ish detective with Victoria’s Major Crimes unit when he becomes the last in an embarrassingly long list of policemen who have shot a member of the public. The fact that the particular member of the public was a career criminal and had shot first is all but forgotten in the bureaucracy’s rush to distance itself from the messy end of policing so Laver is demoted to Senior Constable and shunted to the Mobile Public Interaction Squad (i.e. the bike cops offering directions to tourists and monitoring minor crimes) until a formal investigation into his case can be completed. There, struggling to cope with the double blow of having killed a man and being removed from everything – and everyone – he knows as far as his work is concerned, Laver’s instincts soon lead him into the investigation of something nefarious. It’s hard to know which element of this highly enjoyable novel to highlight first but I’ll start with the characters. Laver is a genuinely interesting reinvention of the classic lone wolf style cop in that he isn’t a natural loner (he has oodles of friends and he likes being with them) but has the quality thrust upon him due to his demotion and quarantining as a scapegoat on which the police hierarchy can blame all their force’s violence and mistakes. We see Laver go through the experience of becoming isolated and watch how he struggles to cope without being able to rely on the friends and colleagues he once took for granted. But at heart Laver is a good cop with a dry, deprecating sense of humour which saves him from being maudlin or dour and there are some gorgeous details, such as the fact he deliberately does the dishes before leaving home on an errand that might kill him, that made him incredibly likeable for me There are other great characters here too, my favourite being the young supermarket assistant manager Jake, who inadvertently becomes involved in a tussle with the criminal underworld after falling for a fellow lap swimmer at his local pool. I was a little wary at first thinking Jake would be a leery kind of bloke with no depth but Place builds his character insightfully, showing how a young man might grapple with the challenges of developing his own personality and character. The story unfolds in a series of short chapters from three main points of view: Laver’s, Jake’s and that of a drug dealer called Stig who arrives in his home town of Melbourne after leaving Queensland under a cloud. Of course the three threads will become intertwined but the various ways in which this happens do not require an unreasonable amount of disbelief suspension and there’s a cleverness to it all which makes turning each page a delight. Add in a good dose of natural humour and a few gentle digs at various aspects of modern life, such as the difficulty of spreading an environmental message to people seemingly preconditioned to ignore it, there’s never a dull moment in ROLL WITH IT. The novel is also dripping with Australian-ness of a more subtle, mature kind than the ‘throw another shrimp on the barbie” kind of thing we used to see a few years ago. Of course a majority of the action takes place in the cafés, alley-ways and live music venues of inner-city Melbourne that are recognisable enough even though I am only an occasional visitor..But there’s more to place the novel here than that, including the often infuriating but highly realistic habit Australian blokes have of nicknaming everyone, usually with some kind of reference to sport. The underlying humour and sometimes contradictory sensibilities on display are also familiar and all combine to form a decently realistic depiction of modern city life for at least some of the Australian population. Having heard virtually nothing about this book before opening the front cover I had no expectations of it but quickly developed a kind of childish excitement that I had stumbled upon something I was going to enjoy very much and I’d read a hundred pages before even realising it. I loved the mixture of farce, satire and thoughtfulness and will be sadly disappointed if ROLL WITH IT doesn’t turn out to be the first in a long line of crime novels from this very entertaining new voice in the genre. Nick Place has been a journalist (including time spent on the police rounds) and writer for a variety of media for 30 years. 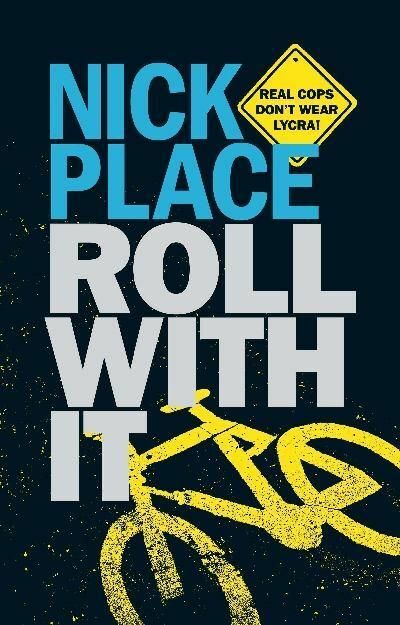 He has written four books for kids but ROLL WITH IT is his first novel for adults. This work by http://fairdinkumcrime.com is licensed under a Creative Commons Attribution-NonCommercial-ShareAlike 3.0 Unported License.